For the last four months I have been in training for my first 5k race. My new found enthusiasm to run, was born while I was on holiday earlier this year, despite a three week spell of bursitus in my ankle that developed on my last day run! This was soon heeled though and my training on the treadmill began. Before long I ventured out on to the road and started to feel quite exhilarated by my new ‘hobby’. I tried to vary my routes frequently to stop myself becoming bored. The race itself was initially going to be more of a personal challenge than anything, however, with several extremely generous donations, it became almost entirely about the charity we would be running for. Cancer research. My Mom, 3 friends and my daughter and her friend became the ‘Hot Chicks‘ team and it was our turn to raise money for this fantastic charity! The original race day was postponed due to the awful weather that we had recently encountered. This wasn’t a huge concern, as it gave us a little longer to raise some money. It then dawned on me, that two of the people that we were running with, had family members that were fighting cancer. Also most of us that were taking part know people, family and friends who have fought the disease. Some have won the fight, some unfortunately have not. It is for all of them that I personally wanted to run, so my training continued. Another ankle injury forced me to rest up for two weeks, very irritating, I guess Im no spring chicken anymore! Especially when It comes to starting exercise at 39 years of age! My poor body must be wondering what on earth is going on! 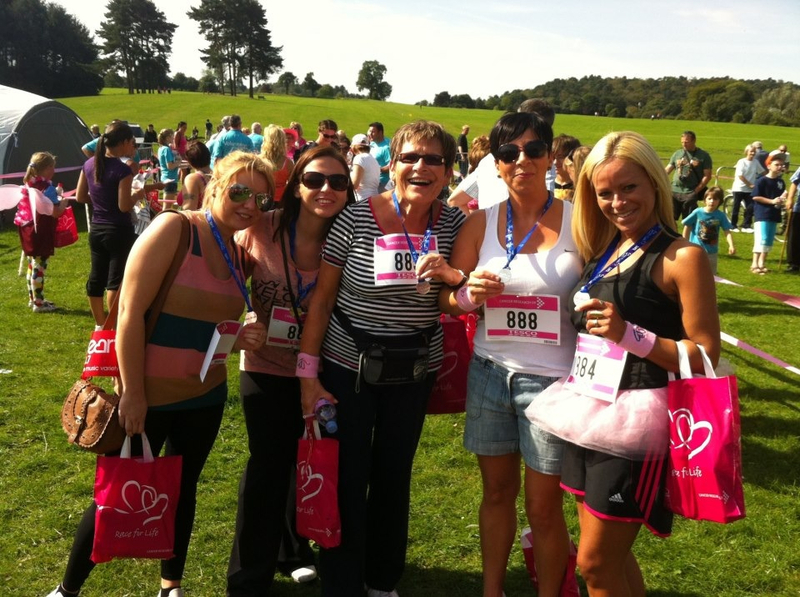 Dressed in my Adidas running shorts and vest, my obligatory pink tutu, race for life visor and sweatbands, I was ready! We had a little warm up aerobics session and the whole event was presented by Rachel from Heart FM and to top it all off, the weather was glorious! Brilliant! Runners to the starting line…. … this was my cue, my moment, I felt really proud to be taking part in such an event. 1…2…3 and we were off! Running on grass for the first time was strange but not too bad although I did think the 1K marker seemed like an awful long way! I ran nice and steady as I really wanted to run the all the way and already some of the runners were walking. Women and girls alike were overtaking me then they would stop and walk and I overtook them again! Coming up to the 4th Kilometre, I just had to walk. Just for about 20-30 seconds up a slippery grass slope. Then I forced myself to run again. I missed the 4K marker which panicked me a little but then I spotted the 500 metres to go sign! Oh my goodness, I launched myself through the air, I pushed my little arms like a 100 metre Olympic runner! My little legs took the biggest steps they have every taken! I sprinted to the finish line, past the cheering Boyfriends, Husbands, Dads, friends, etc, I ran my 5K race in 27 minutes 55 seconds and I felt Euphoric! I collected my medal and goodie bag and waited patiently for my Mom and friends as they were walking. As they finished, we all vowed to come back next year, to raise more money for cancer research and hopefully make a difference to someone who will suffer with this dreadful disease.